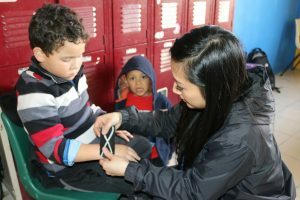 Kinesiotaping can help wrist pain after a fall to help decrease swelling and speed up healing time. 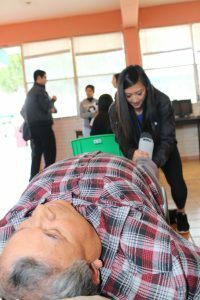 Spinal pain, sciatica, shoulder dislocation, upper neuron motor syndrome, abdominal hernias, abdominal aortic aneurysm, sprained wrists, rib misalignment, bilateral hip pain, upper and lower cross syndrome, torn labrum, torn ligaments, hip pain, tailbone or coccyx misalignment, concussions, Parkinson’s disease, botched surgeries, neck tension, Morton’s neuroma, pre and post pregnancy pain, uterus prolapse, incontinence, growth spurt pain, TMJ, teeth grinding or bruxism –this was my list of diagnoses in just three days! What an experience, right?! Wake up, eat, treat, eat, sleep, repeat. This was the mantra of the Clinic Abroad trip volunteered at last week. I packed my portable chiropractic table and instruments and made my way to rural Piedras Negras, Coahuila, Mexico where sixteen chiropractors, including myself, were expected to treat 3,000 people in a span of a few days. Every day, we were transported to a local elementary school, where hundreds of locals waited to be treated. ProActive Muscle Testing Protocol, Pattern Protocol, spinal adjustments via Gonstead and Diversified technique, extremity adjusting, joint mobilization, soft tissue via manual and instrument assisted, taping, cupping, activator, blocking, craniosacral work, vibration therapy, therapeutic exercises, nutrition education, rehabilitation, postural education, intravaginal manipulation, intrarectal adjustments, dry needling -this is the list of different techniques me and the other fifteen chiropractors utilized at the various schools we volunteered at during this trip. Who knew chiropractors had such a large toolbox to choose from?! Looking at these lists, I cannot be more grateful to the welcoming people of Piedras Negras, the translators who were key to patient-doctor communication, and fellow chiropractors for bettering myself as a chiropractor and individual. 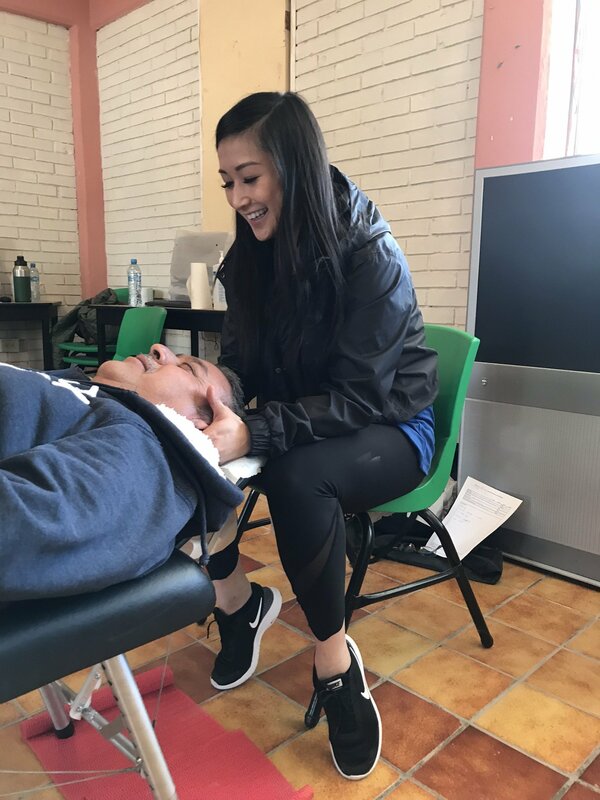 Although I have been involved in meaningful, altruistic experiences while volunteering at various sports and community events, it was this trip that really hit home for me on the magic of chiropractic. This trip specifically has made me an even more confident chiropractor and has shown me that chiropractic can almost treat any diagnoses out there. So, whether you have a sports-related injury or have been through a freak accident or have a gastrointestinal issue, please do not hesitate to give Nicole a call to book a free 20-minute consultation at the very least. Between Dr. Cohen, Dr. Volz, and I, we can guarantee we have the experience and expertise to help you and/or refer you to the right source. It is our mission to help you get back to work, back to play! Ankle sprains respond quickly with a combo of chiropractic adjustments and muscle work. More children are complaining of back pain after carrying heavy books to school.